Samira Ahmed profiles Newt Gingrich, former adversary of Bill Clinton, now a leading contender for the Republican nomination for the US presidential election. Samira Ahmed profiles Newt Gingrich, the American former Speaker of the House who is now a leading contender for the Republican nomination to run against Barack Obama in next year's US presidential election. Earlier this year he was largely written off as a presidential contender when many of his staff left his campaign. But now he has made a dramatic comeback. In the 1990s he was one of the Republicans who led the impeachment proceedings against President Bill Clinton for perjury over his affair with White House intern Monica Lewinsky. Yet at the same time Mr Gingrich was engaged in his own extra-marital affair with the woman who became his third wife. Samira Ahmed talks to people who have known and worked with Newt Gingrich throughout his career. She hears of similarities between Gingrich and Clinton: both had difficult relationships with their step-fathers, dominating mothers, and both wanted to be transformational figures. But Gingrich appears to lack Clinton's personal charm. Gingrich is both attacked and admired as an ideological politician, although some say he is driven by pragmatism and has an acute sense of what will play well with his supporters. With a controversial past - he was fined $300,000 for ethics breaches in Congress - how has he turned things round? 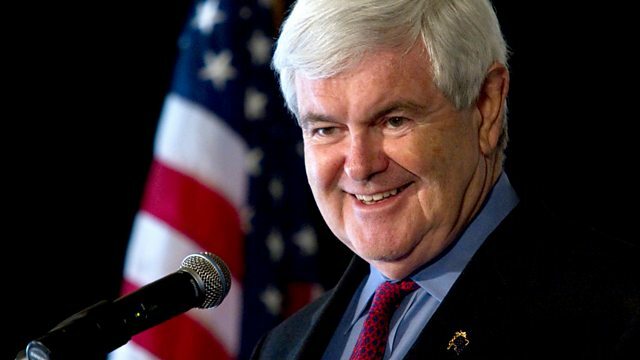 Who is the real Newt Gingrich, and would he make a good president? Ben Crighton and Arlene Gregorius.